Deep in the heart of a ranch sprawling across the foothills of the Chinati Mountains, a stand of dark-green creosote bushes contrasts with the rocky landscape. The August weather is hot and dry, but these plants have some secret source of water. Candace Covington discovered them several years ago while helping with one of several archaeological digs on the ranch. 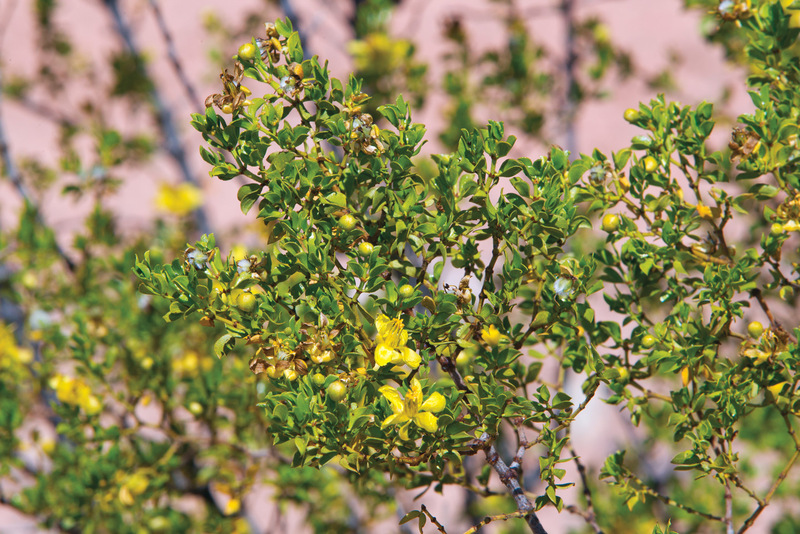 Covington, an Alpine resident, harvests the waxy leaves of these bushes to make Creosote Bush Salve, a concoction she first whipped up while working as a river guide in Terlingua. Chemical sensitivities first sparked Covington’s interest in natural remedies and herbal medicines. The plants growing in the desert south of Alpine, her hometown, and a love for outdoor pursuits further fueled that interest. She also had a friend whose family went back several generations in the area, including a great-grandmother from Mexico steeped in a culture that used holistic healing. One day, that friend told her that his father burned himself badly and used a salve of creosote and Vaseline to treat the burn. 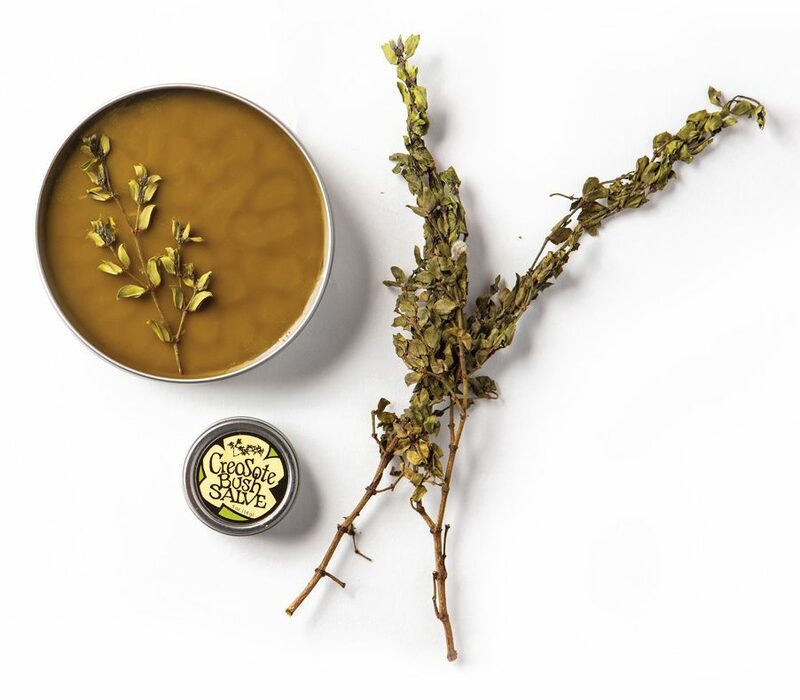 She spent years perfecting the recipe, researching different ingredients and techniques to make a salve as strong and potent as possible. The ingredients of her final product include grapeseed oil, creosote bush leaf, and beeswax (but no Vaseline). Creosote Bush Salve at The Get Go grocery in Marfa and opened one up. A fresh, earthy aroma wafted out. Many West Texans recognize the distinctive smell of creosote and associate it with rain. Scientifically speaking, the scent comes from a combination of volatile oils in the leaves, including terpene (found in pines), limonene (citrus), camphor (pines and rosemary), and methanol (wood alcohol). Locals also recognize the uses of creosote, and many people have told Covington stories about them. “Someone will tell me their grandmother made a salve of it, or they burned it in the house if someone was sick or put it in their shoes to take the smell away,” Covington says. “One customer told me that when he was growing up in Santa Elena just across the Rio Grande, they slept outside most of the summer and kept a creosote fire smoldering to keep bugs away. Covington doesn’t collect leaves from bushes near roads because they may have been exposed to run-off and vehicle exhaust. She instead relies on ranchers in the area who let her harvest on land where the bushes stay green year-round. The most drought-tolerant perennial plant in North America, creosote grows abundantly in the Chihuahuan Desert and throughout the Southwest, including from the Edwards Plateau to the Rio Grande Plains in Texas. Some people call it greasewood or hediondilla. A bush can live at least two years without any water by shedding its leaves and even its branches, but typically the plant is an evergreen, with thick, green, resin-coated leaves that turn golden brown in dry seasons. The color of her salve depends on the color of the leaves, which is why Covington only harvests the green ones. A recent outing to harvest creosote with Covington left me with scrapes and scratches and a couple of itchy bites. Back home, I cracked open a tin and dabbed them all with the salve, taking a deep whiff of its unmistakable scent. For a moment, I went back to that day out in the desert under a wide sky, the silhouette of mountains in the distance, a fresh breeze on my face. I felt better already. • Creosote plants often live 100 years or longer. • The bushes produce clonal colonies, or groups of plants with the same genetic makeup. New shoots grow from the outer edge of the root crown, and older stems die in the center over time. digesting its leaf tissues, jackrabbits are the only mammals known to eat the leaves, and they do so only when desperate. • Jackrabbits and those in search of natural remedies aren’t creosote’s only fans—22 bee species feed solely on this plant’s flowers.